Alice said she was feeling envious when I told her we were going to Danakil. She researched it on line and said it looked like the moon. Now that I’ve been there, I would agree. Not that I have been to the moon, of course, but I think this was probably better. It was certainly more colorful. A representative from the tour company met with us a few days ahead of time to go over the itinerary. I accidentally left my notes from that meeting at home, so for me our morning route unfolded as a series of intriguing surprises. You have to get out and see things early, because the day starts hot and then gets hotter. We headed out right after breakfast. The texture of the dry earth changed as we traveled. On a normal day there are hundreds of salt harvesters toiling out here in the blazing sun. 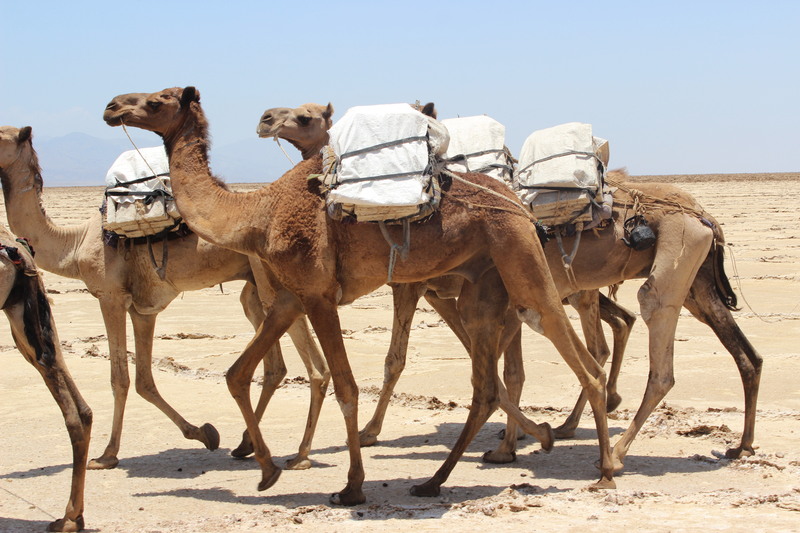 They work in cross-ethnic teams: the Afar men harvest the salt, and the Tigray men take it by camel over the mountains to the markets. We’d been told that they wouldn’t be working this weekend because of the Easter holiday, but our guide spotted a group of camels on the horizon and we drove out to see them. 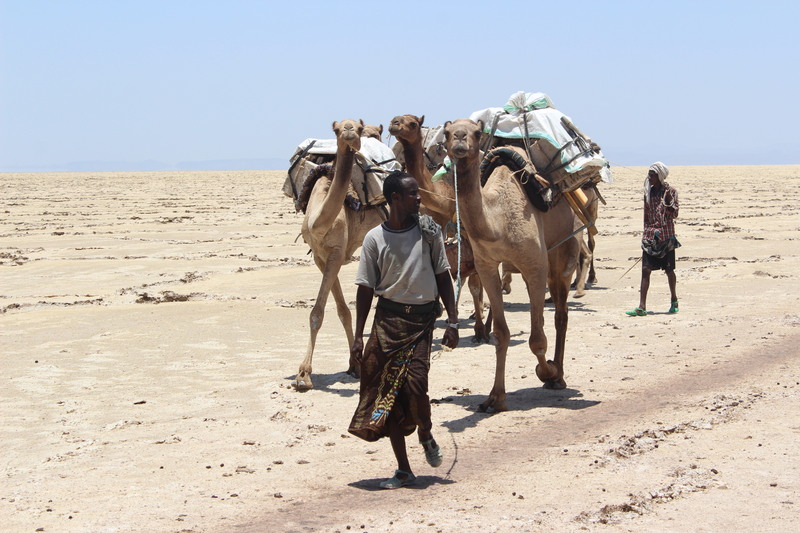 There was a team of Afar men there harvesting salt to bring back to local villages. We felt pretty lucky to be able to see this. It must be one of the hardest jobs in the world. 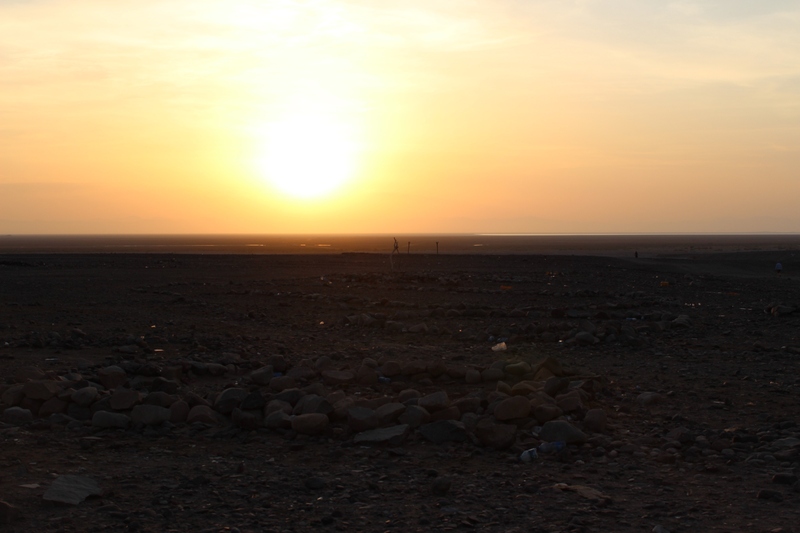 Our next stop was Dallol, which means colorful in the local language. We parked the cars and hiked over a small hill. It was a bit like landing in Oz. Our next stop was an area with volcanic caves. Then back in the vehicles, and off to another colorful area. On the drive home, we encountered the camels we’d seen in the morning, now on their way back to the village with their load of salt. And back to camp in time for lunch. This entry was posted in Around Ethiopia, Ethiopia and tagged Dallol, Danakil Depression. Bookmark the permalink.